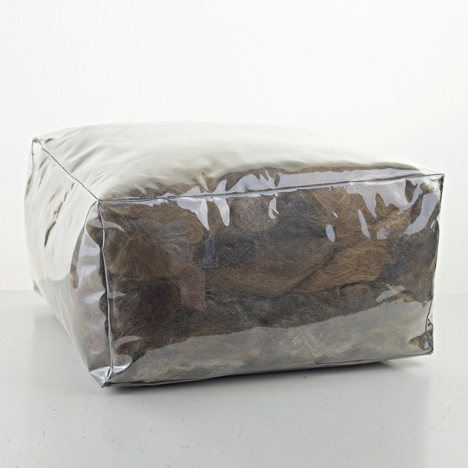 Clumps of human hair are recycled as stuffing for two plastic pouffes by Swedish furniture and product designer Ola Giertz. The pouffes are made from recycled plastic bottles and filled with hair swept up from the floor of a salon, which would otherwise be thrown away and burnt. The design was developed for Studio Västra Sandgatan, a salon in Helsingborg, Sweden, using hair from their customers. The Bare Hair Project will be shown in an exhibition about hair this autumn at the Nordiska Museet, the museum of cultural history in Stockholm. Photographs are by Carl Magnus Johansson. On average, hair grows at a pace of 18 cm per year. Hence, the 9 million Swedes grow about 1 620 000 meters of hair every year, much of which is thrown away and burnt. This is the basis of the The Bare Hair project, the idea of recycling materials to make new things, creating furniture from hair that would otherwise be discarded of. The Bare Hair Project will be exhibited at Swedens largest museum of cultural history, Nordiska muséet. The exhibition “Hair” opens in October 2012.